Need Replacement Home Window Screens in Acworth, GA? Are you tired of bugs, debris, and leaves blowing through your windows? Open up the window, and enjoy the cool breeze again. 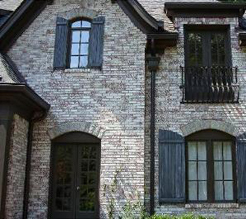 Duke Shutter Company in Acworth, GA, provides custom window screens that offer a blast of fresh air in your home. Whether your window is missing a screen or its existing one is damaged, we'll create home window screens that fit your windows perfectly every time. Our custom screens from Acworth, GA, enhance the beauty as well as the functionality of your home. Your window screen is ripped. Now what do you do? You could take the time to buy a repair kit, research how to fix it, and spend the time to do it. At Duke Shutter Company in Acworth, GA, we have a better option for you. Instead of DIY window screen repair, why not use our team for affordable custom-made window screens? Although you could do it yourself, window screen repair can sometimes be a complicated process that requires a precise hand. Allow our team in Acworth, GA, to provide custom window screens that fit your window precisely. Protect your family from mosquitoes and other blood-sucking bugs. Perhaps your home did not come with screens in the windows. Instead of wasting money on air conditioning costs when the weather is wonderful outside, why not open up the windows? Installing custom screens is more affordable than you may think, and it helps you save money on home cooling costs. Make your home a cool castle. When the weather is just right, you need to let the fresh air in. By providing home window screens in Acworth, GA, we help you bring the good air in and let the bad air out. Our custom window screens fit any window and come in different shades to suit your needs. Contact Duke Shutter Company to get maximum enjoyment of your home by allowing us to equip your place with custom-made window screens. We proudly serve customers in Acworth, Kennesaw, Canton, Woodstock, Marietta, Smyrna, Dunwoody, Johns Creek, Alpharetta, and Roswell, Georgia.